Hello all you saintly people!! I am new here...my first post. I have 2 saints, Jade and Ruby and they are GREAT. I got them when they were nearly 7 weeks old and they are pushing 5 months now. Yes, they are sisters. They are a lot of fun and very, very loving. I take them both out for a walk at the same time. They do not pull the leash. In fact they are so excited to go out that I just hold up the collar and they come and put their head right in it. One is a rough coat and one is short. I would post pictures but I am at work at the moment. It's been amazing watching them grow and learn....and how quickly they do learn and how eager they are to please. We also have a cat who absolutely loves the puppies. you would think he (yes he) was in heat every time we take the puppies out for a walk and he can't be with them. They all three eat out of the same bowl at the same time...(dogs & cat) even though the cat has her own food and bowl, he has to be with the dogs. We also have a ferret that Ruby & Jade like to lick. Rat (ferret) was on the couch one day and Ruby walked over there and she jumped right on Rubys back....but it was even funnier when she jumped on the cats head from the couch. So there is my farm in a nutshell. And oh, did I mention, I also have my daughter, her husband, their daughter with another daughter on the way due the end of next month? Yep....I really should be insane by now, but honestly, my doggies keep me stable. Re: Hello all you saintly people!! Welcome to the board! Sounds like you've got your hands (and house) full, LOL! Welcome to the board! It does sound a little hectice at your place! I'm Alex, my two are listed in my signature. Can't wait to see more pics and here more about your crew! It does sound like you have a full house. Wonder if the cat thinks he's a dog? My name is Chris, and my crew consists of Keiko, a husky/shep mix, Gunther, a great dane, and Nigel and Posey, two rat terriers. I have a few other critters as well. Welcome welcome! Your two girls sounds simply wonderful. I'm Chantel, and I have Daisy, my almost 3-month old black lab! Let's see if this picture thing works! 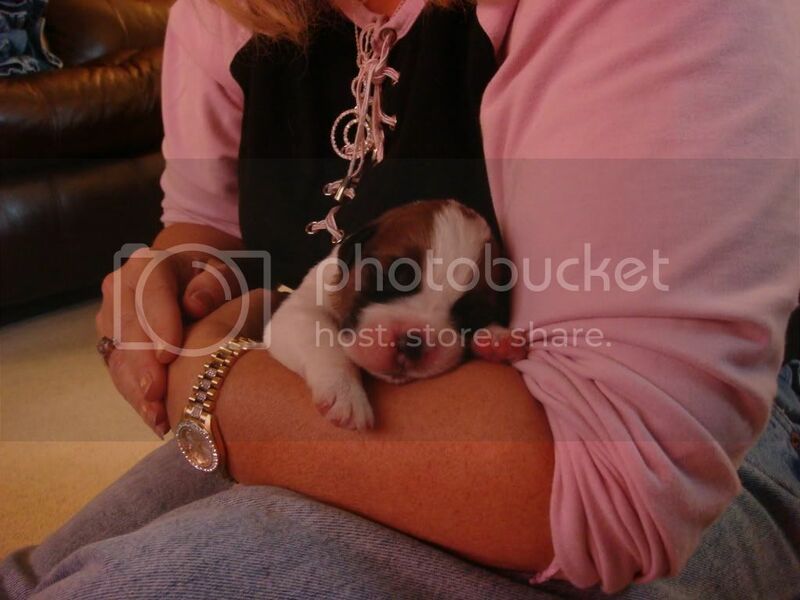 This is one of my girls only one day old. Ruby. 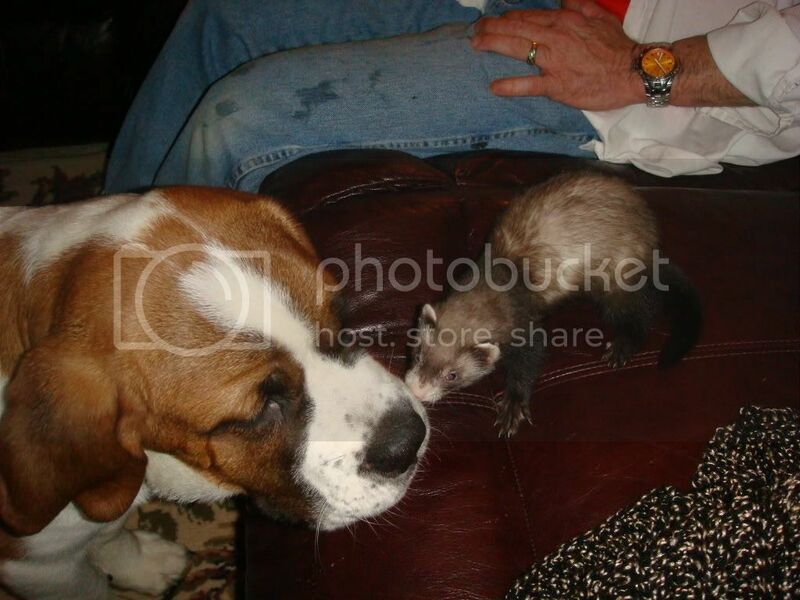 Ruby a few weeks ago with the ferret....just before the big jump on the head and run down the back! Awww, the girls are gorgeous! Welcome to the board. You won't find a better group of helpful and wonderfully compassionate people anywhere else. Keep the pics coming! AW! Hello and welcome! 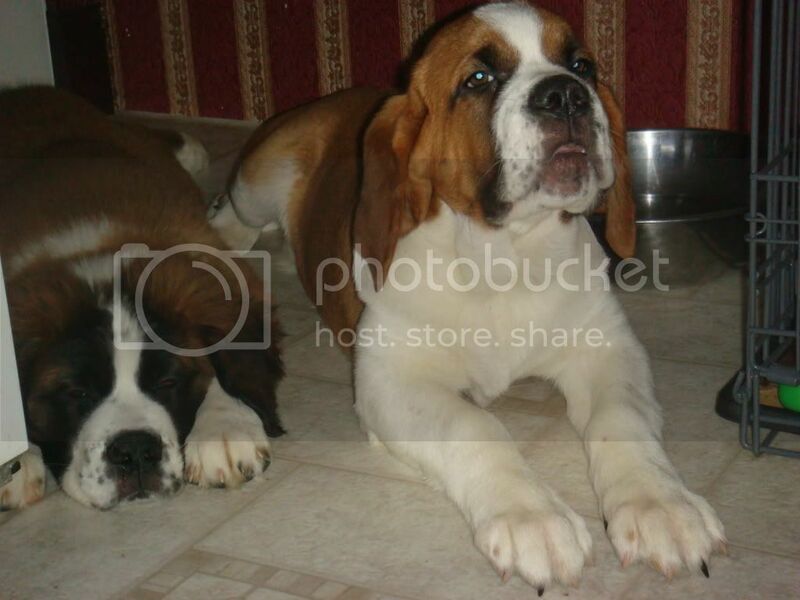 Saints are just the best puppies -I am super biased :p ... I love household with multiple St. Bernards and your girls are gorgeous! agh, I want another saint!! Welcome to you and your precious gems. They are both beautiful. I have to admit though, after 4 decades of owning Saints, I have become partial to the easy upkeep on the smooth coat variety! I couldn't agree with you more. If I ever get another one, I have already said it will be a smooth. Seems like Jade picks up everything from a cookie crumb to a candy cane in her coat. And when the two of them play, Jade is the one who always comes out full of slobber...and she is the one usually on top! She sheds in clumps...unlik e Ruby who always seems so groomed and pretty. But I love her to death and wouldn't trade her for the world. They certainly keep life interesting. Your pups are adorable! I remember Teddy at that age....cant imagine having 2 of them - what fun! I love the look of the rough coats, but yeah, the easy upkeep on my boy is a wonderful thing!